Since our exciting visit last month to the top of One Rincon, a 62-story residential skyscraper under construction on the San Francisco waterfront, more of the building's exterior facade has been added, with the result that it's now more apparent what this prominent addition to the city's skyline will look like upon completion. The picture is not pretty. In fact, it's kind of tacky -- like a castaway from Shanghai's Pudong New Area without all the neon to give it pizzaz. The problem isn't the scale or the height; as a friend of Progress and Industry, Telstar Logistics welcomes high-rise construction in San Francisco's downtown area. No, the problem is the exterior curtain wall designed by architects at Chicago's Solomon Cordwell Buenz. The curtain wall achieves a remarkable effect: The more finished One Rincon gets, the less interesting the building becomes. 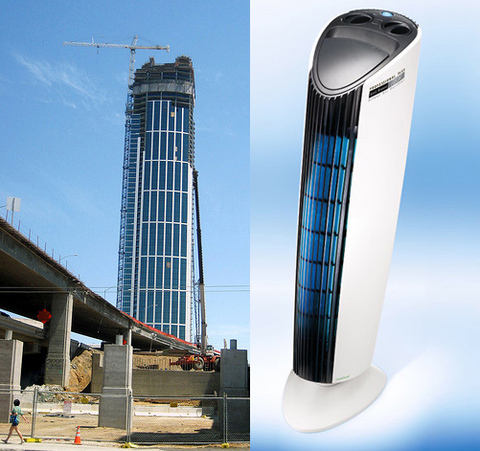 Indeed, over at our Flickr site, one of our Associates shrewdly observed that One Rincon resembles an Ionic Breeze air filter -- the kind made famous by San Francisco-based gadget retailer Sharper Image. As you can see above, the resemblance is uncanny. The thing on the left is One Rincon. The thing on the right is the Sharper Image Ionic Breeze GP. One Rincon will be 605 feet tall. The Ionic Breeze GP rises 28 inches. Apartments in One Rincon begin at around $500,000. The Ionic Breeze can be yours for just $399.95, and if you act now Sharper Image will throw in a second unit for just another $199.98. Presented with a bargain like that, it's no wonder the architects at Solomon Cordwell Buenz may have looked to the Ionic Breeze when searching for a San Francisco landmark that could provide some site-specific inspiration for One Rincon. Are you sure you have that right? Shouldn't it be I Rincon Hill on the right and the Ionic Breeze on the left? This building is so close to blocking my view of the bridge from Noe Valley. The folks to the North of me must be fuming! If only it could clean out smog on Spare the Air days. The IQAir model is one of the best HEPA- style purifiers on the market today. When it comes to finding the best air purifier, it is packed with superior technological features such as a huge capacity prefilter, indicator lights that tell you when a filter change is necessary, and it also has a HEPA filter efficiency rating, second to none. Best air purifiers are hard-to-find, but according to tests this superior machine is definitely a winner! Ha ha .. thatds so funny. I think I have one in my br. Yes nice machinez and good article! Thanks for that article you posted, . Please keep on, I like reading you. Search Nationwide Birth Records Now!